Orme Hardware of Arcanum is a Gold sponsor for the Darke County Food Truck Rally & Competition. 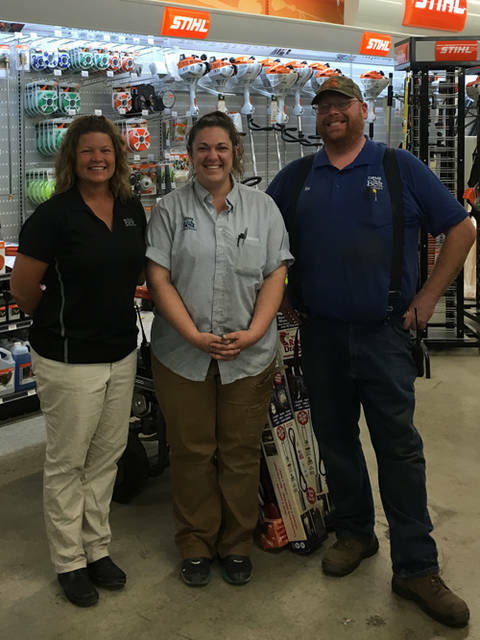 Pictured are Orme Hardware Store Manager Rob Bonds, Orme Hardware Assistant Manager April Raby and Orme Hardware District Manager Michelle Hysong. GREENVILLE – The Dayton Food Truck Association recognized Wintrow Signs and Designs as a Platinum sponsor for the inaugural Darke County Food Truck Rally & Competition on July 21 at the Darke County Fairgrounds. Wintrow Signs & Designs has been in business for more than 22 years, serving local residents and businesses in Darke and surrounding counties. Wintrow now offers screen printing for apparel. The Dayton Food Truck Association also recognized Orme Hardware of Arcanum as a Gold sponsor for the Darke County Food Truck Rally & Competition. The food truck rally and competition will feature more than 40 food trucks from the region. In addition to great food, the event will have more than 50 of the area’s most talented craft vendors and will have a market of one-of-a kind local goods. The charity of choice for the event will be Bunco 4 Boobies, supporting breast cancer patients in Darke County. Live music begins with the Green de Villes from Greenville from 1-3 p.m., Hey There Morgan from 3:30-6 p.m. and Velvet Crush from 6:30-9 p.m. Kid activates include face painting, mining for gems, bungee jumpy ride, carnival games, balloon artist and the Darke County Sheriff’s Department I-Dent a kid will be on site. The Dayton Food Truck Association still is accepting craft vendors, direct sales reps and local artisans. Those who are interested in participating in the event can contact Jason Blackburn at 937-621-2166 or email at popscarparts@reagan.com.